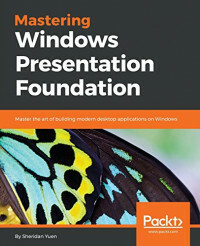 Windows Presentation Foundation is rich in possibilities when it comes to delivering an excellent user experience. This book will show you how to build professional-grade applications that look great and work smoothly. We start by providing you with a foundation of knowledge to improve your workflow – this includes teaching you how to build the base layer of the application, which will support all that comes after it. We'll also cover the useful details of data binding. Next, we cover the user interface and show you how to get the most out of the built-in and custom WPF controls. The final section of the book demonstrates ways to polish your applications, from adding practical animations and data validation to improving application performance. The book ends with a tutorial on how to deploy your applications and outlines potential ways to apply your new-found knowledge so you can put it to use right away. The book also covers 2D and 3D graphics, UI automation, and performance tuning.